“My baby” drools a lot, loves to eat, sleep and did I mention has four legs. If you haven’t guessed yet, “my baby” is a dog. My co-worker’s baby is an actual baby. My bosses baby is his new sports car. 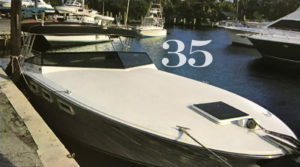 Here is a note from one of our Magnum Marine owners on what he considers to be, his baby! This is “my baby”. I love this boat. Although she was manufactured in 1969, it rides better than many new boats. It has twin Yammar 425 HP. It cruises at about 31 knots and tops out at around 35 knots. Since I took this picture, the inside has been completely remodeled and it looks even better now.